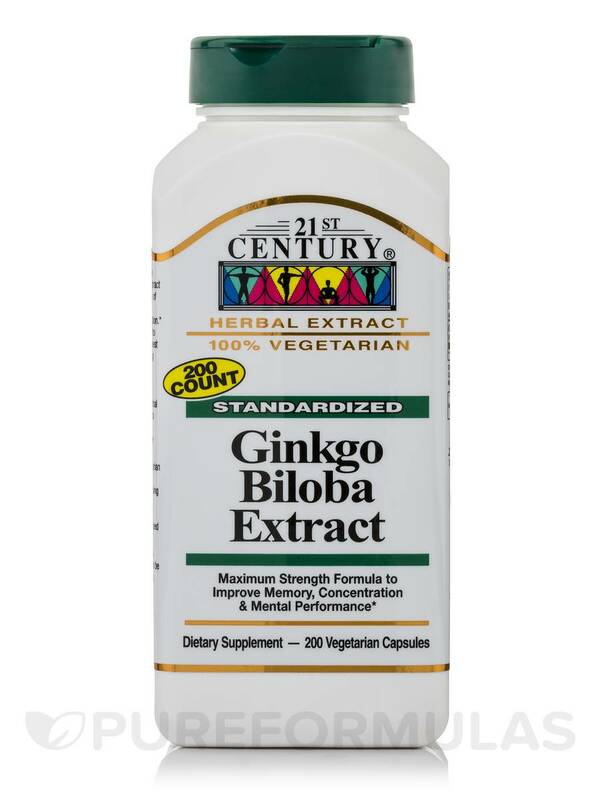 Ginkgo Biloba Extract by 21st Century works good if your dose is 2 tablets a day. Various studies from around the world indicate Ginkgo Biloba Extract improves the natural blood flow of oxygen to the brain to support healthy memory and concentration. 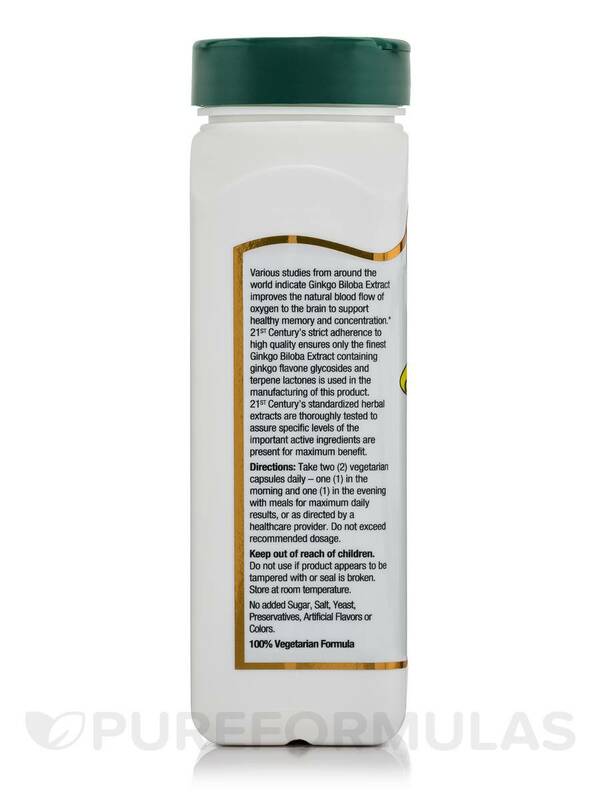 * 21st Century's® strict adherence to high quality ensures only the finest ginkgo biloba extract containing ginkgo flavone glycosides and terpene lactones is used in the manufacturing of this product. 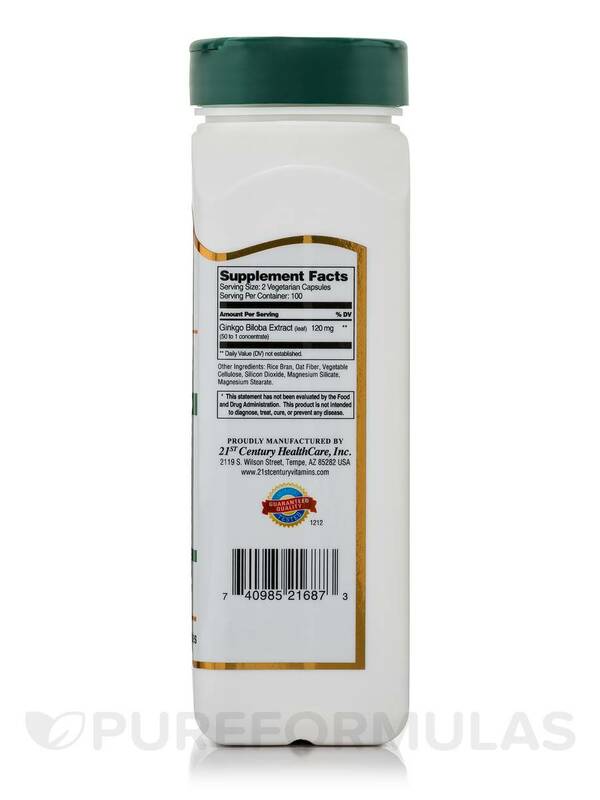 21st Century's® standardized herbal extracts are thoroughly tested to assure specific levels of the important active ingredients are present for maximum benefit. Other Ingredients: Rice Bran‚ Oat Fiber‚ Vegetable Cellulose‚ Silicon Dioxide‚ Magnesium Stearate. Take two (2) vegetarian capsules daily – one (1) in the morning and one (1) in the evening with meals for maximum daily results‚ or as directed by a health care provider. Did this upset my stomach? I've been taking Ginko Biloba for years and never had a negative reaction. Shortly after I began using Ginkgo Biloba by 21st Century in the morning I started to have bouts of nausea. At first, I wasn't certain of the cause, but began by eliminating the most recent addition to my supplements, which was this item, and the problem promptly disappeared. I haven't tried it again, and am not certain of the association. I resumed taking another brand I purchase from Costco at the same dosage and have had no further problems. Great nutrition for the brain. Seems to make my mind more alert and sharper. I was told to take Ginko Biloba from an herbalist I had seen. Said to be good for memory. I cant tell if its working or not but have been taking now for about 4 months. I figure it cant hurt to take a preventative. The price seems really reasonable for the amount you get.